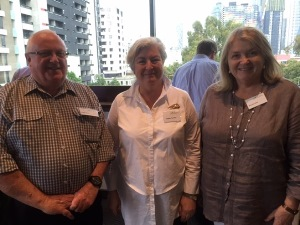 Three of our Board members, Peter Ryan, Colleen Tomlian and Meredith Beck attended the Initial Teacher Education (ITE) panel training with AITSL late last year in Melbourne. They were part of a group of six from South Australia joining other teachers, teacher educators and teacher employers from around the nation. All Australian ITE programs are accredited by state and territory teacher regulatory authorities against the nationally agreed Accreditation Standards and Procedures. Nominations are open for the SA Science Teachers Association 2018 Awards! Nominate a friend or colleague for the SASTA Medal, Helen Castle Memorial Award and Credit Union SA / SASTA Outstanding Teacher Awards. For more information click here. Nominations close Friday 2 March. Call for Workshops is open for the 2018 Annual Conference, hosted by the South Australian Science Teachers Association, which is being held on 16-17 April at Adelaide High School. For more information and to submit a presentation by 7 February click here. MENtor Program for Males in ECE - the theme of this event is a celebration of the fringe work of the many male educators who are leading the way for greater awareness and activism around a gender diverse Early Childhood workforce. Being held on Saturday 17 February, 9:00am – 4:30pm at the University of South Australia, City West Campus. Educators $231, students $116. For more information or to book click here. Sponsorship opportunities are available for registered teachers until 2 February. Kodaly Music Education Institute of Australia is holding a Performing Arts in the Primary Years Years 3-6 workshop about embedding dance and drama in music programs. Saturday 17 February, Adelaide West Uniting Church, 312 Sir Donald Bradman Drive, Brooklyn Park. Non-members $65, members $35, students $20. Contact marglange2@bigpond.com for more information. Nature Pedagogy from Theory to Practice is a series of four day-long workshops exploring nature pedagogy and documentation. Running on Wednesday 7 February, Wednesday 9 May, Wednesday 1 August and Wednesday 24 October. All sessions 9:30am-3:30pm at Gowrie SA, 43 Dew Street, Thebarton. $975 excl GST. To find out more contact briony.brooks@claire-warden.com, tel 0409 091 804 or click here. Natural Maths is holding An Introduction to Natural Maths on Tuesday 23 January. Education Development Centre, 4 Milner Street, Hindmarsh, 9:00am-3:00pm. Cost $135. To find our more click here. Humanities and Social Sciences SA are holding their 2018 HASS SA Conference for teachers F-12 including pre-service on Saturday 24 & Sunday 25 February at UniSA Magill campus. Cost: $130 for teachers, $100 for early career teachers and $40 for pre-service teachers. To find out more click here. Sponsorship opportunities are available for early career and regional teachers. Evidence Based Teaching in School Conference, Wednesday 7 & Thursday 8 March, Victoria University, Melbourne. For more information click here. Understanding the Autism Spectrum for anyone who lives or works with an individual on the autism spectrum. Wednesday 31 January, 9:30am – 12:30pm, members $85, non-members $90. Strategies to Support Individuals on the Spectrum where participants learn how to use a range of social, communication, behavioural and sensory strategies to support individuals on the spectrum. Wednesday 31 January, 1:00pm – 4:00pm, members $85, non-members $90. Supporting Students on the Autism Spectrum in Primary School. Wednesday 7 February, 9:30am-4:00pm, members $165, non-members $175. Supporting the Sensory Needs of People on the Autism Spectrum. Friday 16 February, 9:30am-4:00pm, members $165, non-members $175.